A few weeks ago we started publishing nightly builds for our initial support in ASP.NET Web API for the OData v4.0 protocol. Our OData v4.0 support is based on the OData Library for OData v4.0 that has been released in the past few months. The OData v4.0 protocol introduces a lot of changes and new features that allow more flexibility in the way to model services and improvements over many features from the past versions of the protocol. In addition to this, the OData protocol has been recently ratified as an OASIS standard which will help bolster the adoption of the protocol by many companies and services all over the internet. If you want to know more about OData you can check the official site at www.odata.org where you can find the complete specification of the protocol and the features, the different formats supported and information about existing OData clients you can use in your apps. If you want to take a sneak peak at the new features and changes in the v4.0 version, you can do it here. 1. OData attribute routing: This feature allows you to define the routes in your controllers and actions using attributes. 2. Support for functions: This feature allows you to define functions in your OData model and bind them to actions in your controller that implement them. 3. Model aliasing: This feature allows to change the names of the types and properties in your OData model to be different than the ones in your CLR types. 4. Support for limiting allowed queries: This feature allows the service to define limitations on the properties of the model that can be filtered, sorted, expanded or navigated across. 5. Support for ETags: This feature allows to generate an @odata.etag annotation based on some properties of the entity that can be used in IfMatch and IfNoneMatch headers in following requests. 6. Support for Enums: We’ve improved our support for Enums and now we support them as OData enumerations. 7. Support for $format: We’ve also added support for $format, so clients are able to specify the desired format of the response in the URL. 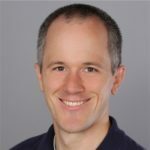 The OData v4.0 protocol includes a lot of new features and many changes to existing ones that improve the protocol and the modeling capabilities for the services implementers, but at the same time, those changes make difficult to support multiple versions of the protocol in a single implementation. For that reason, we have decided to create a new assembly to support the v4.0 version of the protocol while maintaining the current assembly for those people who want to implement services based on previous versions. 1. The package ID for the v4.0 is Microsoft.AspNet.OData. 2. The assembly name and the root namespace are now System.Web.OData instead of System.Web.Http.OData. 3. All the extension methods have been moved to System.Web.OData.Extensions. 4. We have removed all the extension methods that used to exist for HttpRequestMessage like GetODataPath or GetEdmModel and we have added a single extension method, ODataProperties that returns an object containing the common OData properties that were accessible by the old extension methods, like the IEdmModel of the service or the ODataPath of the request. 5. MapODataRoute has been changed to MapODataServiceRoute. 6. QueryableAttribute has been changed to EnableQueryAttribute. For the sake of consistency between versions, we have done the same set of changes in the Microsoft.AspNet.WebApi.OData to achieve a similar development experience. Only the namespace remains System.Web.Http.OData in this version. The current methods and class names can still be used with the System.Web.Http.OData (OData v3.0), but we have marked them as obsolete, and they are not available in the new assembly. Enough talking, let’s write an OData v4.0 service! We’ll start our new OData v4.0 service by creating a simple web application that we’ll call ODataV4Service. We’ll chose to use the Web API template that will install the default Web API packages required for our application. Once the basic application has been created, the first thing we need to do is update the existing Web API packages to use the nightly versions hosted on MyGet. In order to do that, right click on “References” in the project we have just created on the solution explorer, click on “Manage Nuget Packages” and expand the Updates section on the left. Check that there is a source for WebStack Nightly, and if not, just proceed to add it by clicking the Settings button on the left bottom corner of the window and adding the source in the windows that appears after clicking, as shown in the following figure. As you can see from the image, the URL for the nightly ASP.NET packages is http://www.myget.org/f/aspnetwebstacknightly/ and you can see all the different published packages on https://www.myget.org/gallery/aspnetwebstacknightly. 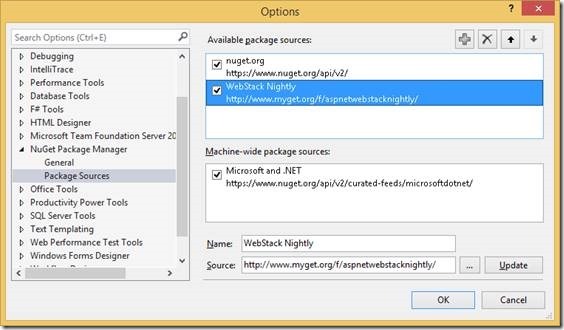 Now that we have setup our nightly package source we can go and update the Web API packages. In order to do that, we need to select the Include Prerelease option on the dropdown menu on the top of the window. Then we just need to click Update All. 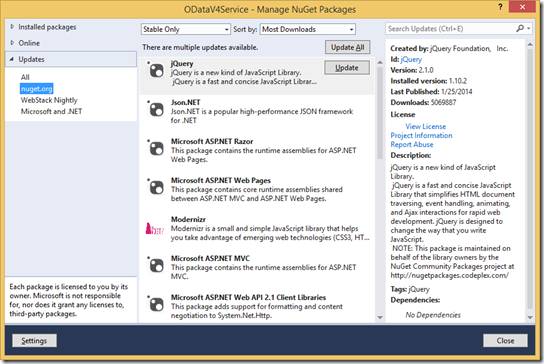 Before leaving the Nuget Package Manager we need to install the Web API 2.2 for OData v4.0 package, in order to do that, we expand the Online tab, select the WebStack Nightly Source and the Include Prerelease option and then search for Microsoft.AspNet.OData. After installing this package, we can exit the Nuget Package Manager and try running our application by pressing F5. The default page should appear in the browser. At this point we have successfully configured our OData service, but we haven’t defined yet any controller to handle the incoming requests. Ideally we would use scaffolding for this, but we are still working on getting the OData v4.0 scaffolders ready for preview (the existing scaffolders only support OData v3.0 services). So we have to create our controllers by hand, but we’ll see that with attribute routing it’s not difficult at all. As we can see on the figure above, we can use ODataRoutePrefixAttribute to specify a prefix for all the routes in the actions on the controller, and we can use ODataRouteAttribute to specify further segments that will get combined with the ones in the prefix. That way, the GetFeed action, represents the route /Teams and the GetEntity action represents routes like Teams(1), Teams(2), etc. Now that we have a basic service up and running, we are going to introduce some business logic. For that, we are going to define a function that will give us the teams whose rating is around a certain threshold with a given tolerance. Obviously, we could achieve the same result with a query, but in that case, the clients of our service are ones responsible for defining the query and might make mistakes. However, if we give them a function, they only need to care about sending the right parameters. Functions can be defined at the service level (unbounded), at the collection level (bounded to collection) or at the entity level (bounded to the entity). In this case, we have defined a function bounded to the collection, but similar methods exist on the ODataModelBuilder class (to define service level functions) and on the EntityConfiguration class (to define entity level functions). Important note: If you try this in IIS, you’ll probably get a 404 response. This is because IIS doesn’t like the dot in the URL on the last segment (IIS thinks it´s a file). One possible way to fix this is to add piece of configuration on you web.config to ensure IIS runs the routing module on all the requests. So far we’ve seen attribute routing and functions, now we are going to show another very interesting feature, model aliasing. Many times we want to expose some data from our domain, but we want to change things like the names of the domain entities or the names of some properties. In order to do that, we can use model aliasing. As we said above, query limitations allow a service to limit the types of queries that users can issue to our service by imposing limitations on the properties of the types of the model. A service can decide to limit the ability to sort, filter, expand or navigate any property of any type on the model. In order to do that, there are two options, we can use attributes like Unsortable, NonFilterable, NotExpandable or NotNavigable on the properties of the types in our model, or we can configure this explicitly in the model builder. In this case, we’ll do it though attributes. The meaning of Unsortable, NonFilterable and NotExpandable is self-explanatory, as for NotNavigable it is a shortcut for specifying that a property is Unsortable and NonFilterable. When a client issues a query that involves a limited property, the server will answer with a 400 status code and will indicate the limited property that is causing the request to fail. The next feature we are going to see is ETags. This feature allows a service to define what fields of an entity are part of the concurrency check for the entity. Those fields will be used to generate an @odata.etag annotation that will be sent to the clients when returning the entity, either as part of a feed or just the single entity. The client can use this ETag value in the If-Match and If-None-Match headers to implement optimistic concurrency updates and efficient resource caching. In order to mark a field as part of the concurrency check, we can use the ConcurrencyCheck attribute or the Timestamp attribute. It’s important to note that we should use one or another, but not both at the same time. The difference strives in that ConcurrencyCheck is applicable to multiple fields of the entity and Timestamp is meant to be applied to a single field. Now, we will serialize the ETag of the entity when we retrieve it through a GET request, but we still need to take advantage of the ETag on the actions of our service. In order to do that, we are going to add a Put action and we’ll bind ODataQueryOptions<Team> in order to use the ETag. As we can see, we can take advantage of the ETag by binding ODataQueryOptions as a parameter and using the IfMatch or IfNoneMatch properties in that object in order to apply the ETag value to a given query. In the above example, we check if the ETag on the IfMatch header exists and if so, if it doesn’t the value of the Team with the id represented by the URL to return a Precondition Failed status in that case. The above query uses a MIME media type and includes parameters in order to ask for a specific JSON version. The OData client for .NET has been released this week, the following blog post contains the instructions on how to use it to generate a client that can be used to query Web API for OData v4.0 services. Along with the nightly build we have published samples with the new features and new samples showing off common scenarios that target OData v4 in the ASP.NET codeplex site. We have started publishing nightly builds for our OData v4.0 support that it’s built on top of the ODataLib support that has already shipped. Our nightly builds can be found on http://www.myget.org/f/aspnetwebstacknightly. The package ID to find them is Microsoft.AspNet.OData (Remember to select IncludePrerelease in the Nuget Package Manager). We’ve also seen a brief introduction to all the new features in this version, like OData attribute routing, functions, model aliasing, query limitations, ETags, enums and $format. You can find samples for all the new features in https://aspnet.codeplex.com/SourceControl/latest#Samples/WebApi/OData/v4/.